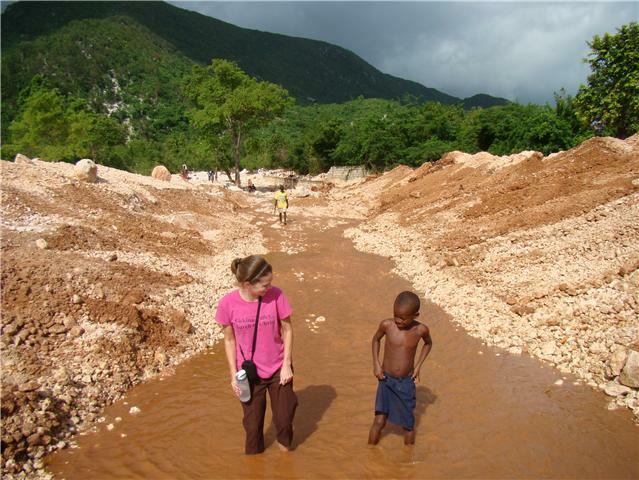 Ginny in Haiti: Summer camp! We all packed up last week and headed up near Port au Paix to run a week of church camp. We started out only accepting 50 Haitian kids but by the end of week somehow had 73-with kids outside begging to get in everyday. Odessa and Sandra had a blast! Sandra (6yrs) had never seen anything like that before. Being quite the tomboy, she loved the recreation games and was better at them than some of the older boys! Odessa loved being the center of attention with the American group from California and she loved the craft time. The team from California put together a bible story plan around the story of Jonah. They did skits, had colorful displays and surprisingly they learned church songs in Creole! The Haitian kids were so excited that the Americans were learning the songs in the Creole language. They learned, "Jesus Loves the Little Children, I Have Decided to Follow Jesus, and Lord I Lift Your Name on High." The group leader, Jason, came with a guitar-I think the kids would have sat and sang with him for the entire day if they could have! These kids live so far out in the country that they do not get programs like this at all. One day I was dying for a Coke or Pepsi. David and I left the camp and went out looking. No luck. There was literally NOWHERE 20 minutes in either direction to buy pop. SO you can see how the week long camp was a big deal to them. I pray it has a lasting effect and they hold onto the bible lessons.